Rhys Hoskins has shown power in spurts, but not consistently, this season for the Phillies. With only about eight weeks remaining in the regular season, the 2018 Phillies are in the bizarre position of becoming the victims of their own success. Much of the good feeling created by the team during the first four months of the season was tested over this past weekend when they lost three of four in San Diego to the woeful Padres. Making matters worse, the powerful Boston Red Sox make a quick stop in Philadelphia for games Tuesday and Wednesday – and the Phils do not have their ace Aaron Nola or veteran Jake Arrieta scheduled for starts. It was just a few weeks ago that Nola and Arrieta had terrific outings in Boston where they should have won two against the Red Sox, but settled for a split of that two-game series. Even more important for the Phillies is a looming five-game stitch against the New York Mets, with the first four games in Philadelphia, and then a Sunday game in Williamsport to help celebrate the Little League World Series. It should be nothing new for these Phillies to be facing another stretch of games during which they can prove their worth – are they for real, or will the past few months be quickly forgotten as the Philadelphia Eagles get closer to their defense of a Super Bowl championship? So far the Phillies have always answered the bell. Whenever there was a "prove-me" stretch of games, the Phillies proved they were for real. There was the difficult month of June, and then the stretch after the All-Star break, and all the Phillies did was manage to hang on to a piece of first-place in the division. However, there has never been a margin for error, and when the losses accumulated in San Diego, the Phils found themselves facing the Red Sox back here in Philadelphia, looking up at the Atlanta Braves. This season has been like climbing a mountain of doubt for the Phillies. The Phils have climbed from station to station, setting up camp in April, May, June and July. The problem they are now facing is that if they falter in August, they lingering feeling will be that they fell from their perch and landed on their faces at the bottom of the hill. When you take into consideration the rather modest hopes for the team when the season started you might think anything from there is gravy, but that is not the case. This will be a critical period for the Phillies for more than just this season. 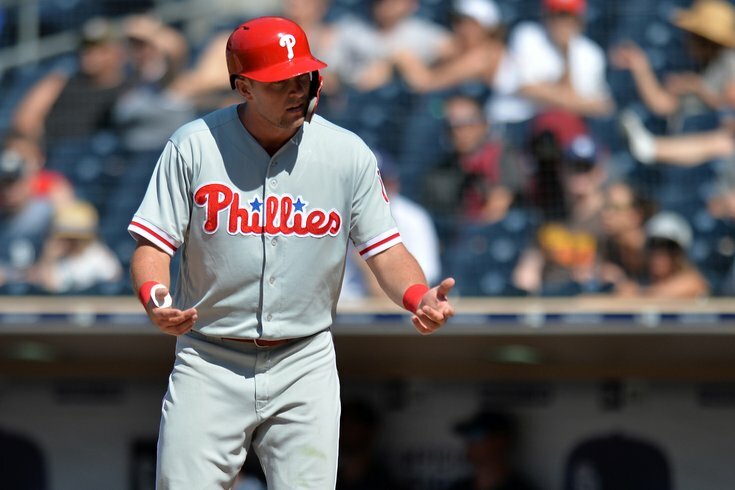 In the short term, the Phillies now have to worry about catching the Braves, and staying ahead of the Washington Nationals – who have totally underachieved this season. There is also the matter of other tams making a charge for a wild card spot, including the late blooming St, Louis Cardinals. The bigger problem will be long-term damage that will occur if the Phils implode. This is a team that is bing built for the future, and this season should be a huge building block. It has been a strange season in that first-year manager Gabe Kapler has used some unconventional methods to coax a team to a long stretch of success. The biggest plus has certainly been the development of Nola as one of the premier pitchers in Major League Baseball. Other than that there are still a whole lot of question marks, starting with Scott Kingery who has not lived up to expectations, and certainly not lived up to his historic contract. Kingery has made a difficult transition to shortstop, but his offense has been woeful. In terms of fan interest, Kingery was a huge jolt of optimism when the season started, and as the team heads toward late August most fans are now wondering why he is still on the Major League roster, and not getting his swing back together in the Minors. It’s a pretty good bet that Kingery will eventually turn into the impact player the Phillies need. However, in terms of what people expected, there is no doubt he is far below expectations. The same can be said of Rhys Hoskins, who has not provided the consistent power expected after his torrid run through the end of last season. This 2018 season for the Phillies has been odd on a number of levels. The team has exceeded what many expected in terms of winning, but individually the offensive production and defensive play has been underwhelming. The starting pitching has been the team’s strength, and although the bullpen has improved, they still do not have the lock down closer many expected to see in Serenthony Dominguez. Despite some pretty good inside baseball number, first baseman Carlos Santana has been less than expected, and although Jorge Alfaro has one of the best arms in baseball, his defense behind the plate has cost the team more than a few runs. When the season started the hopes for this team is that we might all see the young players develop, and if they managed to stay in contention along the way it would be a bonus. Instead, the bottom line on this team is going to be much more simple – success will be measure in wins and losses. There was too much success early to let it all slip away late and watch the team become an afterthought through September. For both this season and fan interest going into next season, the Phillies had better clean up on the Mets at the end of this week and get on a roll toward September.